-Solo Artist's Booth @ the Seattle Art Fair - August 2-5 (complementary VIP passes courtesy of Samuel Freeman). -You're An Eagle Now - In-Studio Preview: 7-10 pm. -Double-Jointed Spiral - Hardcover books available for purchase. -Big House - Exhibition reviews. Tail Feathers, 2018, Oil, Graphite and Spray Paint on Canvas, 72 × 54 in. 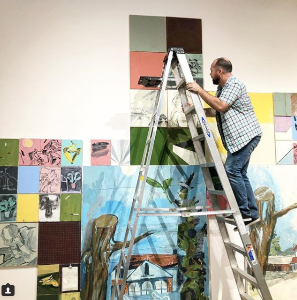 You're an Eagle Now - In-Studio Preview: 6:30-9:30pm Next Monday, July 23 from 7-10 pm, I will host a casual viewing party of You're An Eagle Now, the installation of paintings to be exhibited with Samuel Freeman at the Seattle Art Fair next month. I will provide food, libations, and a powerful fan to help keep you cool. Please RSVP by replying to this email if you plan on attending. Double-Jointed Spiral In the Winter newsletter I mentioned that I was putting together a collection of my artist writings. 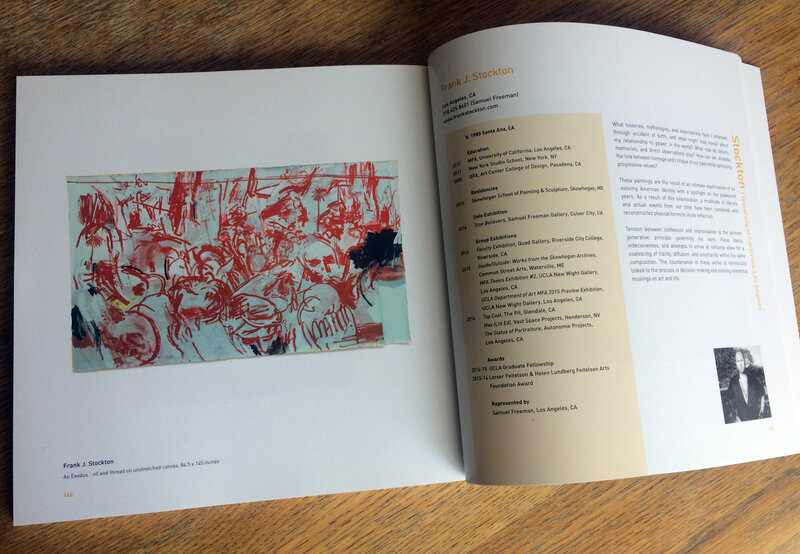 Double-Jointed Spiral is a collection of ideas and notes on contemporary painting based on my studio practice. Organized into five chapters distinguished by hue, it is equal parts reflection, love letter, and manifesto. The hardcover book can be purchased here for $24.99. http://www.blurb.com/b/8823276-double-jointed-spiral Click the link above to see a preview. I was fortunate to have received a couple of thoughtful reviews on January’s Big House solo show at DENK gallery in Downtown Los Angeles. The first is by Genie Davis for artandcakela.com, and the other is with long-time supporter Beatrice Chassepot of beartmagazine.com. Check them out if you get a chance. That’s all for now. I look forward to sharing more news you in a few months. 2018 is off to a wild start in many ways. I’m excited to share some of the news that’s been happening in the Stockton household. On Tuesday, January 2nd, Vanessa and I welcomed our son Grey Stockton into the world. 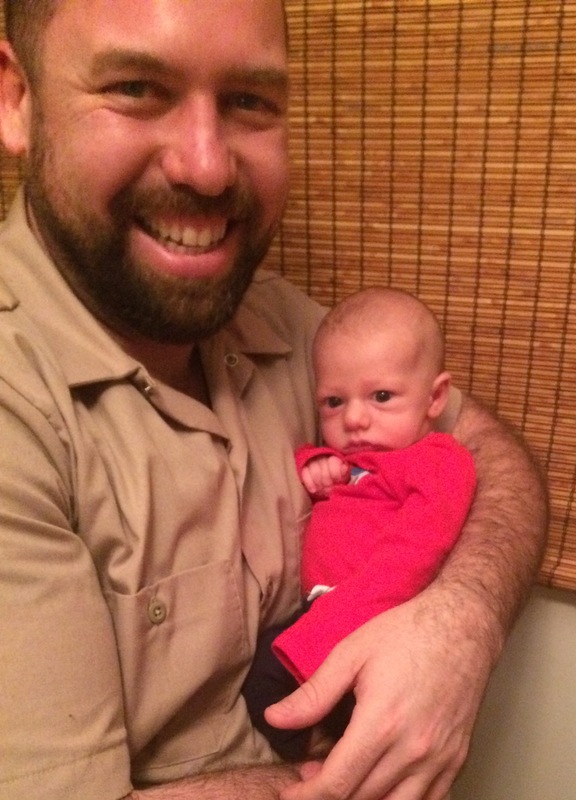 He was born weighing 6 lbs., 12 oz., and has gained about two pounds in his first month. Grey’s hobbies include eating, sleeping, and rolling from front-to-back during tummy time. My new hobbies include changing diapers, staying awake into the wee hours of the morning, and carrying Grey on walks around the neighborhood. As if that wasn’t enough excitement, my solo show, Big House, opened on January 20th at Denk Gallery in the Downtown L.A. Arts District. 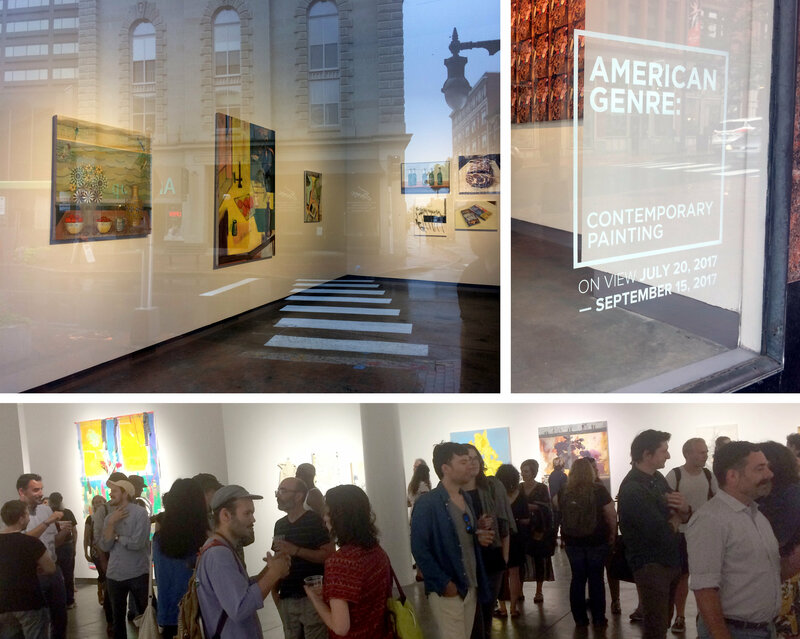 The opening had great energy and featured an open bar, which also kept spirits high. Vanessa was even able to make a brief appearance. 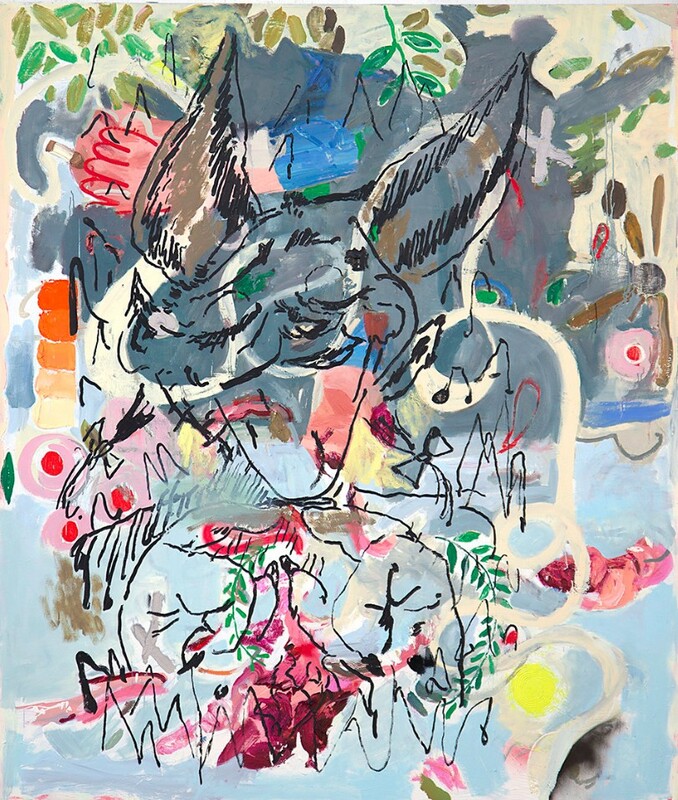 In addition to my solo show, Denk is featuring a fantastic group show, Shift, of the esteemed artists Iva Gueorguieva, Karen Carson, Kim Dingle, and Elisa Johns. Above are some installation shots and a picture of Vanessa & me at the opening. View images of the complete installation & individual works on my website. Click here to see pictures of the finished installation and individual works on my website. 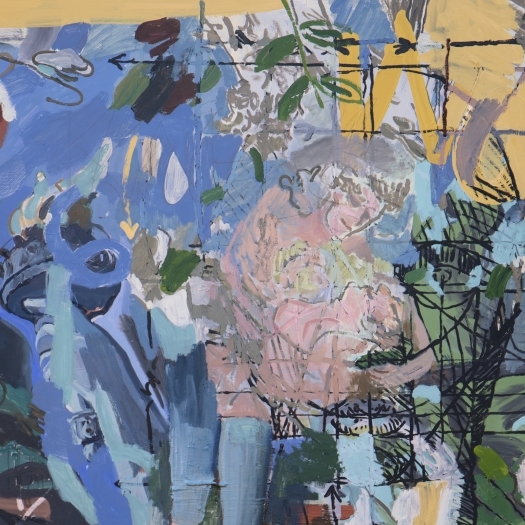 Click here to view works available for purchase on Artsy. 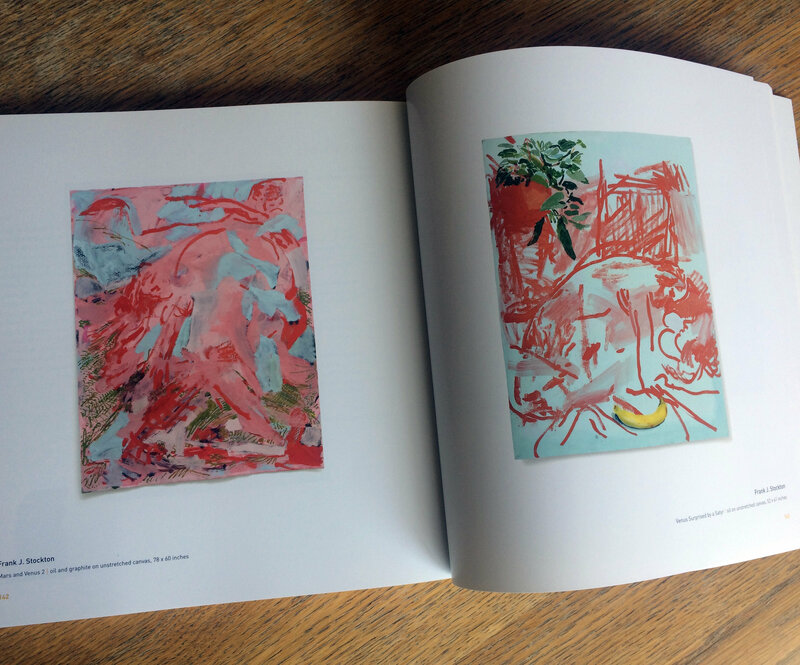 The Pacific Coast issue of New American Paintings (#133) also arrived in January, featuring three brand new paintings that are also included in my show at Denk Gallery. Please don’t ask me to autograph it for you, though. This month, friends Beatrice and Laurent Chassepot are exhibiting a portion of their art collection at the Alliance Française de Los Angeles that includes one of my paintings. The show will be on display during the entire month of February. I am also putting the final touches on a collection of casual notes and writings on painting & art called Double Jointed Spiral. Shoot me an email and let me know if you would like a copy when it’s finished. It’s been a busy summer inside and outside of the studio. Here are some brief updates on what I’ve been up to for the past few months. I hope you enjoy. 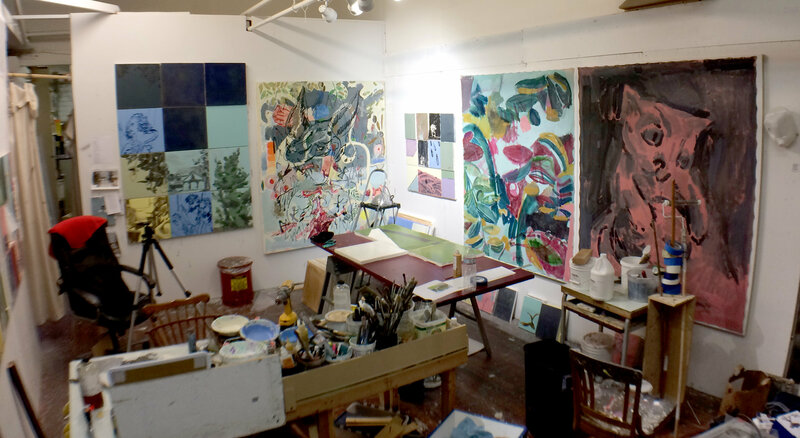 On June 11, my studio mates and I hosted our first Open Studio event to share recent and in-progress artwork with the public. The event garnered a solid turnout, and response to the work was enthusiastic all-around. We felt the experience was a tremendous success and look forward to possibly hosting another in 2018. I would like to offer my personal thanks to those of you who were able to attend. 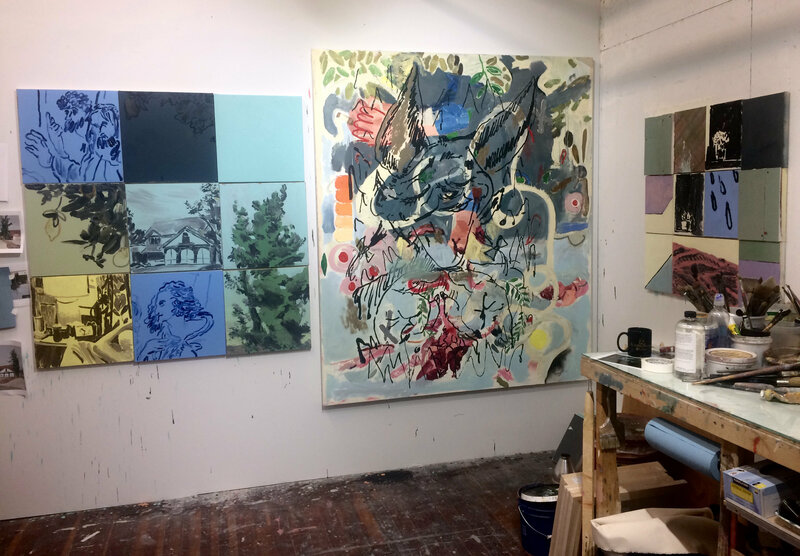 I have included images of my Open Studio display and of the recent completed painting, Terrible Infant (2017) above. 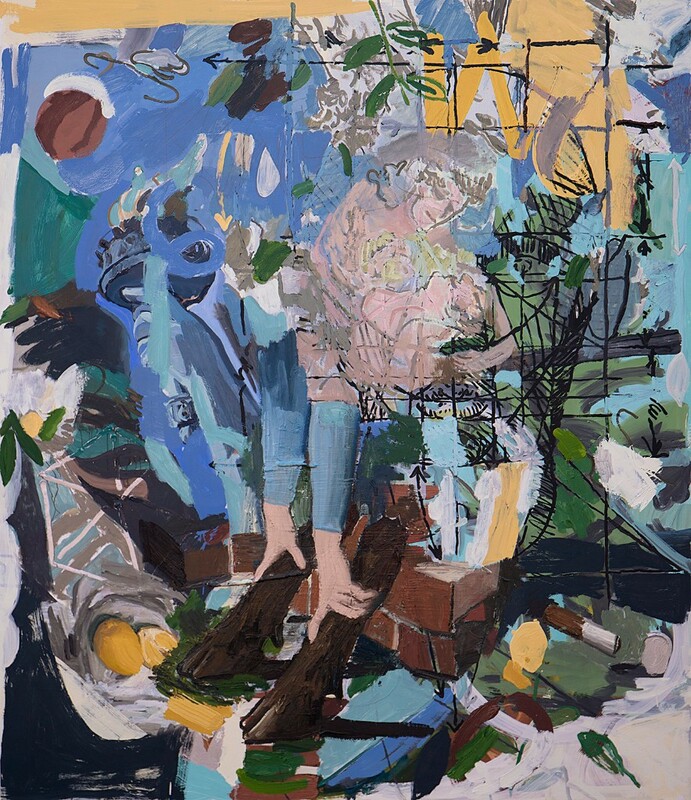 American Genre: Contemporary Painting at the Institute of Contemporary Art at the Maine College of Art in Portland, ME is a survey of contemporary art exploring the role of three historical painting genres as a framework of knowledge for understanding and contextualizing contemporary painting practices. When I attended the show’s opening back in July, I felt a tremendous sense of humility and gratitude to see my painting, Swimmer (2017), hanging alongside the work of some of my favorite painters working today. 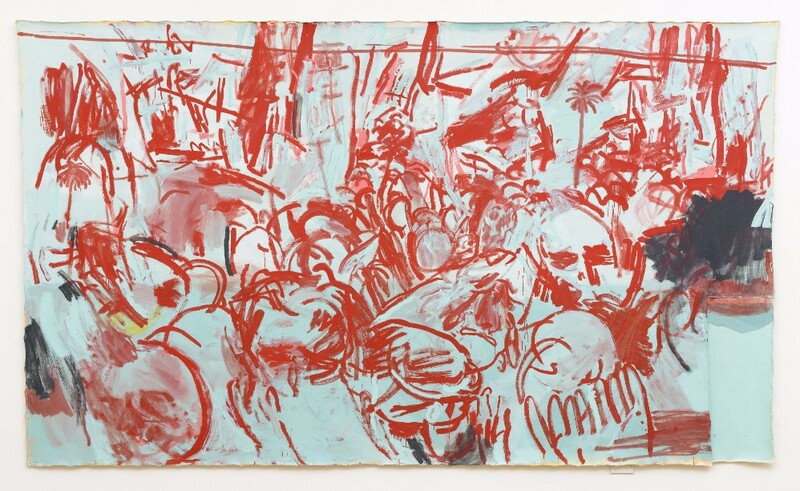 On Friday, September 15th the Institute will host a daylong symposium and panel discussion featuring a handful of participating artists and writers, along with the critic Barry Schwabsky and the show’s curator, Michelle Grabner. 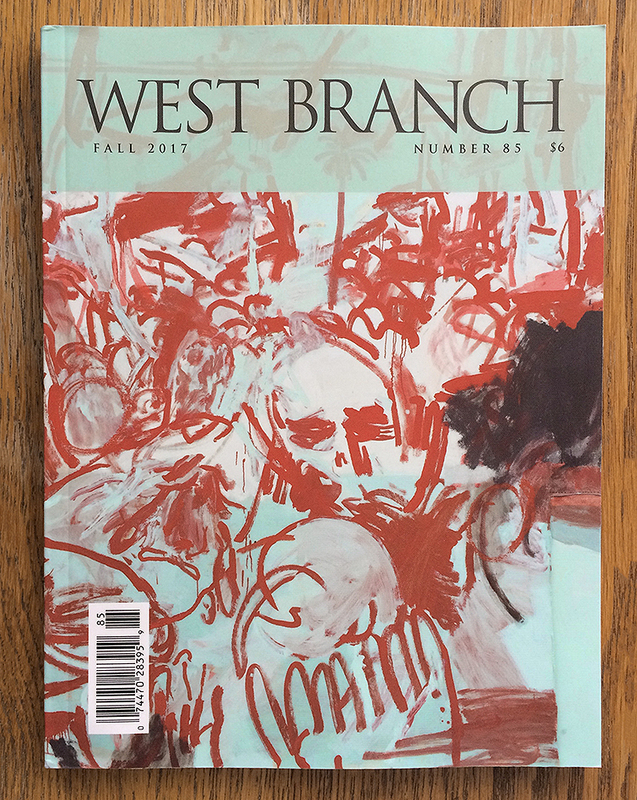 A wrap-around crop of my painting, An Exodus (2016), is featured on the current edition of West Branch, a professional literary journal published thrice yearly by Bucknell University. 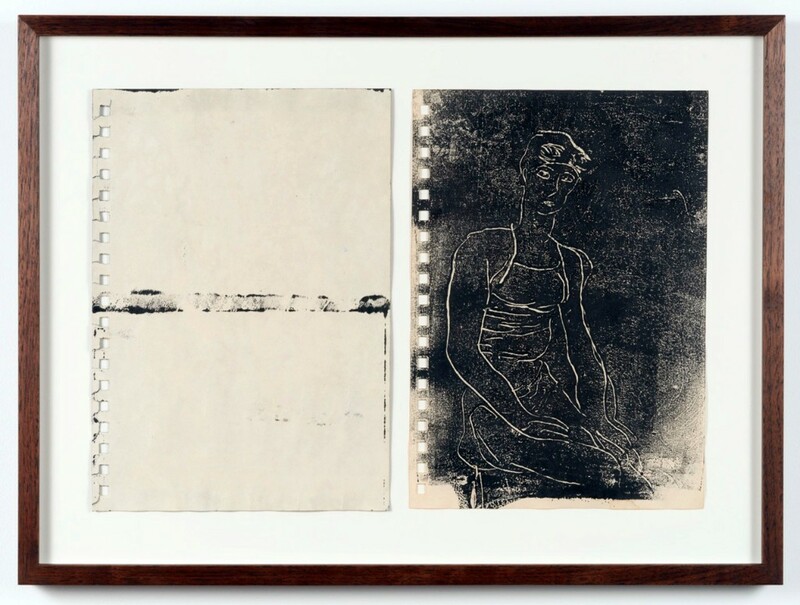 The journal, which features short stories, essays, poetry, and book reviews, reproduces a work by a contemporary artist on the cover of each issue. Thank you for reading. I expect to have more exciting news to share in the coming months. In the meantime, follow me on Instagram where I often post studio shots and works in progress. Have a great Fall! 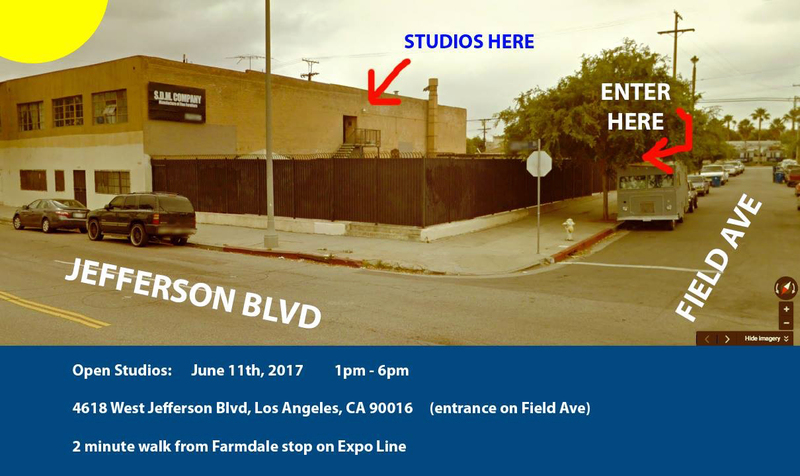 On Sunday, June 11, from 1-6pm, I will be co-hosting an open studios event along with my studio mates at 4618 W. Jefferson Blvd. in the West Adams area of Los Angeles. The event will be a great opportunity to view my process up close and to get a sneak peek at a new cycle of paintings that I have been working on for the past year and a half. Participating artists will include myself, Heather Brown, Andrew Foster, Sulai Lopez, Anthony Miserendino, Michael Charles Neumann, and Rob Remer. Hi friends, I hope this message finds you well. I have some exciting news and events to share with you for this Spring. This weekend I will have a pair of monotypes up for auction at the 38th Annual Venice Family Clinic Art Walk & Auction in Venice Beach. 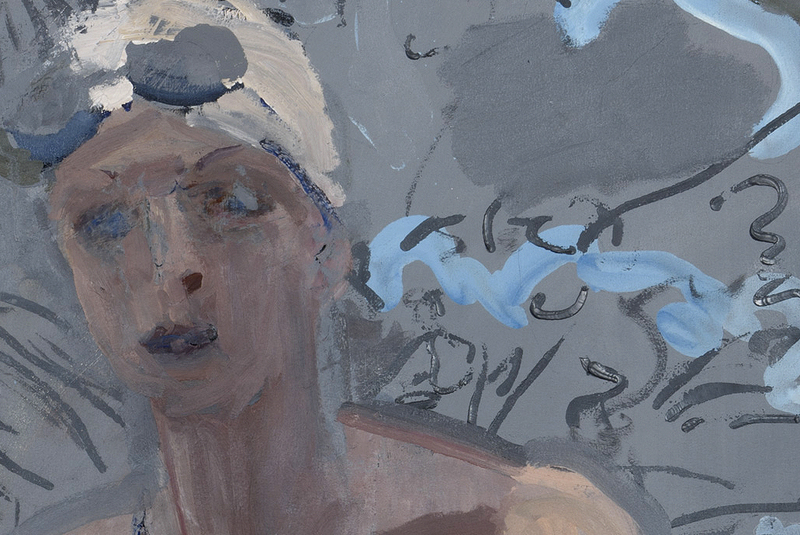 The drawings are from a series of “Swimmer” monotypes that I created last Winter from a found photograph of the Olympian swimmer Kathleen Genevieve “Katie” Ledecky. The frame was generously donated by Samuel Freeman Gallery. 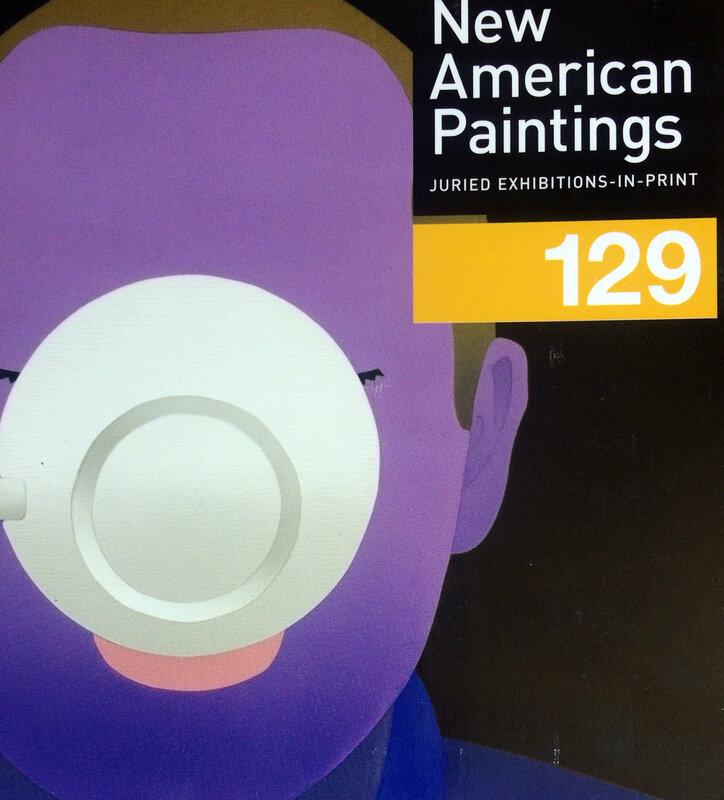 Last month, I was fortunate enough to have some work published in issue #129 of New American Paintings. The selection features work from my show, True Believers, exhibited at Samuel Freeman Gallery in Culver City last May. The issue will be available at bookstores and newsstands through the end of this month. Click "CONTACT" on the menu to your left to sign up for future updates from Frank J. Stockton.